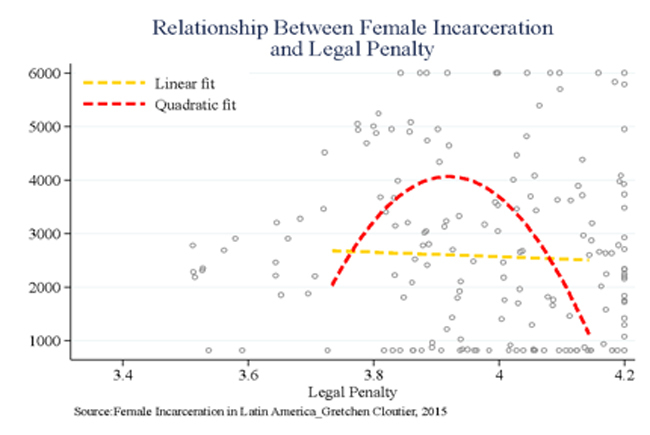 With a threshold of p < .05 (the cut-off for statistical significance at the 95 percent level) the results show a number of significant factors related to the incarceration rates of women in Latin American countries. The R squared value is .2664, meaning that the independent variables account for about 26 percent of the variance in the dependent variable, incarceration of women. Although the feminization of poverty does not meet the 95 percent significance level (p = 0.065), it can be used to partially explain the increase in incarceration rates of women because a correlation is likely as it does meet the 90 percent level of significance—a generally accepted threshold, though admittedly not as strong at the 95 percent level. According to this model, a one-unit increase in the feminization of poverty, as measured by a ratio of women to men living in poverty, is associated with a 36.77213 unit increase in the incarceration rate of women. Because women are the unit of measurement in this case, statistically about 36 more women will be incarcerated for every unit increase in the feminization of poverty. As seen in Figure B, there is a positive trend indicated by the correlation between the feminization of poverty and female incarceration. The second main independent variable, intense drug laws, is significantly related (p = 0.00) to the increase in incarceration rates of women. The average index rating for the intensity of drug laws for Latin American countries in this study is approximately 4. A one unit increase in the intensity of drug laws is associated with a 6161.68 unit increase in incarceration rates. This means that approximately 6,161 more women will be incarcerated for each one-step increase in the drug law intensity index. Due to this finding, we accept the hypothesis (HA1); if there are more intense drug laws in a country, then there will be higher rates of female incarceration in a country. The intensity of drug laws arguably criminalizes women disproportionately to the severity of the crime committed. Other factors not considered as main independent variables, those that are related to the liberation theory of female offending, were also found to be statistically significant in considering the incarceration rates of women. There is a positive relationship between lower secondary education completion rate for women and incarceration rates of women (p = 0.00). According to the model, a one-unit increase in lower secondary education completion is associated with approximately 133 more women incarcerated. Furthermore, the female unemployment rate is a statistically significant factor (p = 0.042) in determining women's incarceration rate. The relationship is negative, demonstrating that a one unit increase in the unemployment rate among women is associated with approximately 78 fewer women incarcerated. Due to these results, the null hypothesis (H03) that factors of female liberation do not significantly affect rates of female incarceration, can be rejected, and the hypothesis (HA3) that factors of female liberation will significantly affect female incarceration rates can be accepted. Neither female population (p = .092) or female labor force participation (p = .098) were statistically significant. The results of this model demonstrate that the most significant factors associated with female incarceration rates are intensity of drug laws and the rate of women that complete secondary education. The female unemployment rate is also statistically significant, and the rate of women in poverty compared to men (the feminization of poverty) is correlated, although not statistically significant at the 95 percent level. It may seem surprising that there is a positive relationship between the number of women who complete secondary education and the number of women incarcerated; however, this correlation is demonstrative of the liberation theory of female offending. The fact that more women complete secondary education is an outcome of increased overall inclusion of women in society. Women's liberation and greater participation in society is not only limited to legitimate sectors, but rather opens opportunities to women throughout the underground and criminal parts as well. Similarly, the negative relationship between female unemployment and female incarceration rates may seem counter-intuitive. While this result is slightly harder to understand, it can be understood in the context of economic marginalization theory. Traditionally, women in Latin America have not been employed in the formal job sector and only recently have they begun to seek employment outside the home. While employment outside the home can be empowering and a source of independence for women, it is also often a result of increased financial pressures on the family. Instead of working domestically and caring for children and the elderly, women are tasked with both earning income through formal employment for the families as well as caring for them in the home. This financial stress can drive women to commit economically motivated crimes, as described by the economic marginalization theory. Therefore, a higher unemployment rate may mean that women are not facing the burden of being both breadwinners and care takers for their family, as they are only working informally in their households. They do not have the dual obligations of both caring for their family and working outside the home to make ends meet. Without this pressure, fewer women will be motivated to commit economic crimes such as drug offenses, leading to fewer women incarcerated. It is important to recognize that economic marginalization theory and liberation theory are not mutually exclusive, but rather that as women become increasingly integrated into society, they are becoming so under desperately unequal economic conditions. Thus they may be dually motivated by liberation and economic marginalization to commit drug-related crimes. The feminization of poverty variable does not reach traditional levels of significance; however, the modest positive relationship apparent in the scatter plot and the fact that it does meet the somewhat less stringent 90 percent significance threshold does suggest that the trend may in fact exist and could become statistically apparent if the quality of the data improves. Recall that the data suffer from two distinct problems. First, the strength of the variable could be diluted by the fact that the data include non-drug related incarcerations. Second, the panels are unbalanced with a large number of missing values. While interpolation was able to replace approximately half those values, it cannot calculate values for observations that are surrounded by additional missing values nor can it calculate values for the first missing value in a panel. If these problems can be addressed, the mild trend which has been displayed in this study may become more clearly manifest in the data. 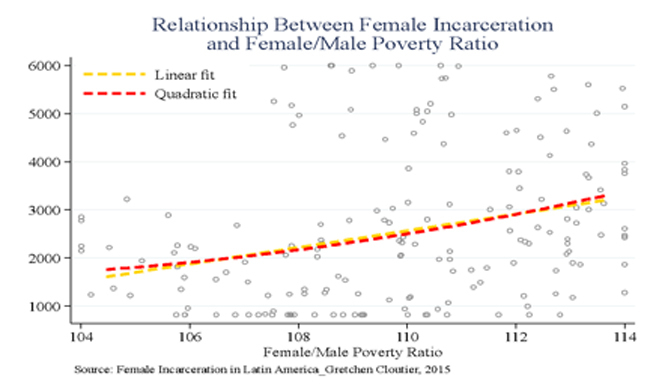 Therefore, it is entirely possible that the feminization of poverty is indeed important for understanding how the unique economic vulnerability of women contributes to incarceration rates. In further studies, more specific and complete data for both the ratio of women to men in poverty and female incarceration rates may demonstrate that the feminization of poverty is indeed statistically significant at the 95 percent level or higher. Due to the imperfect nature of the data sets used in this paper, the results are close enough to this threshold to consider more deeply. Accepting the feminization of poverty as a contributing factor to incarceration rates of women highlights the need to reform social welfare policies so that they directly target economically vulnerable women, and, in turn, address the root causes of gender-based economic inequality. Not surprisingly, the intensity of a country's drug laws has a positive relationship with the number of women incarcerated. Harsh laws that carry long sentences for drug crimes such as simple possession target low-level mules and street dealers, who are often poor women. Long sentences also exacerbate the problem, with more women becoming incarcerated but few being released. A one step increase in the intensity index of a country's drug laws is associated with over 6,000 more women being incarcerated, showing the extreme societal consequences of these War on Drugs policies. By reforming non-violent criminal codes and at least decriminalizing possession of reasonable amounts of drugs for personal use, Latin American countries could reduce their female incarceration rates by the thousands. Treating drug use and dependency as a public health issue instead of criminalizing addiction restructures the paradigm of how these infractions and the people who commit them are treated by society. Instead of sentencing a woman to years in prison for simple possession, outpatient treatment programs and counseling should be utilized. This not only helps the woman and any dependents she has, but also benefits society as a whole in terms of social cohesion and contributions from productive members of society. Moreover, possession for small-scale trafficking may indicate dire economic need rather than malicious criminal intent. These cases highlight the need for better social safety nets and improved welfare policy, not the criminalization of impoverished, non-violent offenders. This paper began with an examination of two relevant theories of female offending: liberation and economic marginalization. The feminization of poverty was used as an empirical demonstration of the economic marginalization of women in Latin America. A quantitative approach used the feminization of poverty, the incarceration rates of women, and intensity of drug laws, along with variables to control for female liberation in a fixed effects regression test across seventeen Latin American countries. The results found that drug law intensity, female lower secondary education completion rate, and female unemployment rate significantly contribute to female incarceration rates. The feminization of poverty, taking into account complications with the data, may also be a contributing factor. The results support the liberation theory of female offending and the economic marginalization theory, showing that the two theories are not mutually exclusive. As society further engages women, it does so under increasingly marginalizing economic circumstances. Furthermore, the results demonstrate the adverse effects of the globalized War on Drugs, which significantly increases female incarceration rates throughout Latin America. Policy considerations as an outcome of this study could include improving social safety nets to target vulnerable population of women, and reforming criminal codes to treat low-level, non-violent drug crimes as a public health issue rather than felonies. As the decriminalization movement gains momentum across the Americas, this change may become a reality, and help to lower the number of women behind bars. I thank Dr. Eugene Walton at American University for his statistical expertise and assistance with the quantitative analysis for this study. Barberet, Rosemary. Women Crime and Criminal Justice: A Global Enquiry, 1st edition. New York: Routledge, 2014. Campbell, Howard. 2008. "Female Drug Smugglers on the U.S.-Mexico Border: Gender, Crime, and Empowerment." Social Thought & Commentary 81 (1): 233-267. CEPALSTAT. 2014. "Feminine Poverty Ratio." CEPAL. Chant, Sylvia. Gender, Generation, and Poverty: Exploring the ‘Feminisation of Poverty' in Africa, Asia, and Latin America. Northampton: Edward Elgar Publishing, 2007. Chesney-Lind, Meda and Lisa Pasko. The Female Offender: Girls, Women and Crime, 2nd edition. Thousand Oaks: Sage Publications, 2004. Giacomello, Corina. 2013. "Women, drug offenses and penitentiary systems in Latin America." International Drug Policy Consortium, October, 2013. Giordano, Peggy C. 1978. "Girls, Guys and Gangs: The Changing Social Context of Female Delinquency." Journal of Criminal Law and Criminology 69 (1): 126-132. Hunnicutt, Gwen and Lisa M. Broidy. 2004. "Liberation and Economic Marginalization: A Reformulation and Test of (Formerly?) Competing Models." Journal of Research in Crime and Delinquency 41 (2): 130-155. "Information Sheet for U.S. Citizens Arrested in Paraguay." Embassy of the United States: Asuncion, Paraguay. Insula, Jose, et. al. 2013. The Drug Problem in the Americas. Washington: Organization of American States. International Centre for Prison Studies. 2014. "World Prison Brief." London: International Centre for Prison Studies. Medeiros, Marcelo and Joana Costa. 2007. "Is There a Feminization of Poverty in Latin America?" World Development 36 (1): 115-127. Metaal, Pien et al. 2011. Systems Overload: Drug Laws and Prisons in Latin America. Washington: Washington Office on Latin America and Transnational Institute. Murdoch, Sharlene, et al. 2012. "A Descriptive Model of Female Violent Offenders." Psychiatry, Psychology and Law 19 (3): 412-426. "Nicaragua." 2014. U.S. Department of State – Bureau of Consular Affairs: U.S. Passports and International Travel, August, 2014. Ray, R. and A.C. Kortewg. 1999. "Women's Movements in the Third World: Identity, Mobilization, and Autonomy." Annual Review of Sociology 25 (1): 47-71. Reckdenwald, Amy and Karen Parker. 2008. "The Influence of Gender Inequality and Marginalization on Types of Female Offending." Homicide Studies 12 (2): 208-226. Reynolds, Marylee. 2008. "The War on Drugs, Prison Building, and Globalization: Catalysts for the Global Incarceration of Women." NWSA Journal 20 (2): 72-95. Rolles, Steve and Niamh Eastwood. "Drug Decriminalisation in Practice: A Global Summary. International Harm Reduction Association, ch. 3.4." Rosmarin, Ari and Niamh Eastwood. 2012. A Quiet Revolution: Drug Decriminalization Policies in Practice Across the Globe. New York: Open Society Foundations. Smith, P. 2012. "Belize Ponders Marijuana Decriminalization." Stop the Drug War, July, 2012. Transnational Institute. 2015. "Drug Law Reform in Latin America." Amsterdam: Transnational Institute. Umana, Isabel Augilar and Rikkers, Jeanne. 2012. "Violent Women and Violence against Women: Gender Relations in the Maras and Other Streets Gangs of Central America's Northern Triangle Region." Interpeace, 2012. Walmsley, Roy. 2012. World Female Imprisonment List, 2nd edition. Essex: International Centre for Prison Studies. World Bank Group. 2014a. "Female Population." World Bank. World Bank Group. 2014b. "Female Unemployment." World Bank and International Labour Organization. World Bank Group. 2014c. "Labor Force Participation." World Bank and International Labour Organization. World Bank Group. 2014d. "Lower Secondary Completion Rate." World Bank and UNESCO. Information on specific drug laws can be fond at: Transnational Institute. 2015. "Drug Law Reform in Latin America," Amsterdam: Transnational Institute; Steve Rolles and Niamh Eastwood, "Drug Decriminalisation in Practice: A Global Summary," International Harm Reduction Association, ch. 3.4: 157-165; Ari Rosmarin and Niamh Eastwood. 2012. A Quiet Revolution: Drug Decriminalization Policies in Practice Across the Globe. New York: Open Society Foundations: 1-42; Metaal and Youngers, "Systems Overload," 2-98; P. Smith, 2012. "Belize Ponders Marijuana Decriminalization," Stop the Drug War, July 2012; "Nicaragua," U.S. Department of State – Bureau of Consular Affairs: U.S. Passports and International Travel, August 2014; "Information Sheet for U.S. Citizens Arrested in Paraguay," Embassy of the United States: Asuncion, Paraguay.